Emil Hrabovskyi was born in 1892 in Uzhhorod. 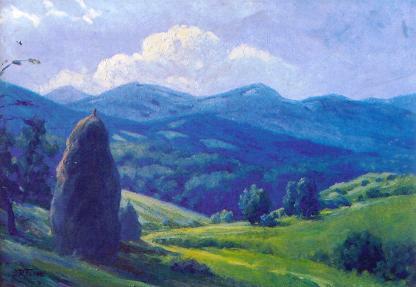 His artistic legacy of around 500 paintings and drawings became a valuable part of the Transcarpathian and Ukrainian art. 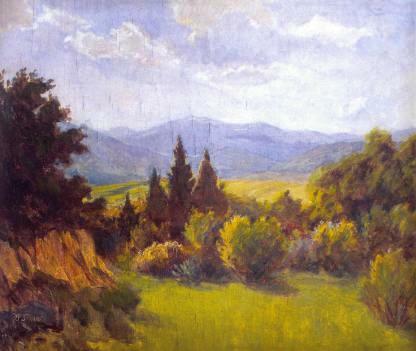 His works reflect the influence of the Hungarian realist tradition, the Transcarpathian School of Art (that he helped to found) and his own sensitivity to those fleeting moments of the day when, for example, the sunset is almost over or the mist in the mountains is about to disappear. Hrabovskyi’s landscapes truthfully reflect the nature, but because he chooses subjects that are dear to him and focuses on those ephemeral moments, he is able to bring in a level of lyricism that the views before him offer and that he uncovers. Hrabovskyi was slowly building his reputation and acceptance. His art was flourishing during the Soviet area when the state was creating an atmosphere favorable to the artists, buying his paintings and making them parts of the permanent exhibitions in the museums of Lviv, Kiev, Dnepropetrovsk and others. Hrabovskyi passed away in 1955, two years after a solo exhibition showing over 90 artworks documenting his career development.